The typical digital consumer spends nearly two hours on social networks and in messaging services every day, and reaching these customers is an important part of any company’s marketing strategy. A large part of this effort comes from paying attention, listening to your audience online, and analyzing metrics; accordingly, 82% of high-performing marketers integrate their social media marketing activity into other tools, including their customer relationship management (CRM) platform. Your social media analytics can give you valuable insight into your audience — and your relationship with them. When you know your community, you can effectively engage with them. One important step is to trust your employees to advocate for your company online. You should also reach out to influencers. With an encouraging company culture, your happy employees will naturally create positive social media posts. Your publishing strategy — along with the content created by your employees, organic posts about job openings, answers to questions, and general conversations with members of your audience — will have a positive impact on your metrics. The most important metrics, which measure your efforts against your goals, will ensure your social media marketing strategy succeeds. 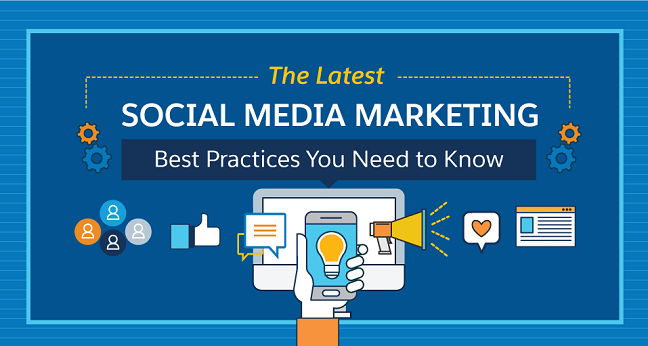 Use these social media marketing best practices to help your brand succeed online, in the infographic below.